Liverpool don’t so much surge into the quarter-finals, as soar there. That’s how easy this 3-1 win away to Bayern Munich eventually was. So much for this club representing something of a complex for Jurgen Klopp. By the end, Bayern were crumbling – having been initially torn apart by fine goals from Sadio Mane and Virgil van Dijk – in what looked real end-of-an-era stuff. It might also be the end of an era for the Champions League. Having occupied 15 of the 32 last-four places since 2011 and not allowed a semi-final without them since 2009, Bayern and Real Madrid are now out of the competition at the last-16 stage, replaced by the old 2004-’09 status quo: the Premier League. Liverpool’s win made it a clean sweep for the English clubs in the last 16 ties, which should naturally bring a few tortured analogies about Brexit given the political events of the last week. Here, Liverpool only tortured Bayern, and the Premier League certainly tortured the Bundesliga. They won all three face-offs against German sides, with this 3-1 making it 17-3 in total. The ease with which Liverpool eventually beat Bayern shouldn’t take from the class they displayed in doing so. They once again displayed they are such a serious side, and again potential winners, of the type Bayern used to be. To think this game initially started off so tense and nervous. The strike that set things off might genuinely be one of the most distinctive – perhaps even properly unique – goals that you will see in this or any other season. So much of it was just so inventive and innovative. Sure, there were familiar elements, like the fact Mane scored again and Neuer made yet another mishap, but so much of it was frankly stunning. There was first of all the supreme Ronald Koeman-style ball from Virgil van Dijk, that was pretty much put on Mane’s toe. The forward did still kill it with the perfect touch, and in the process may have killed final perceptions that Neuer is still a top ‘keeper. In just another one of the errors that have become so common in his career, the goalkeeper was inexplicably far off his line and pretty much marking Mane. He’s no centre-half in that regard. So, having instantly taken control of the ball, Mane then took Neuer for a walk as he swiftly sidestepped him. That was flowingly glorious enough, but there was still more, since there were more Bayern players to beat. With supreme presence of mind and the finest precision, however, Mane lifted it over the sliding bodies and into the corner of the net. After such a trudging start from both sides, that may well have been compounded by a presser like Jordan Henderson going off injured for Fabinho, there was now speed and life. There had to be. Bayern needed a response. They offered one, and finally succeeded in something that they had been trying through the first leg: targeting Joel Matip. Serge Gnabry burst into the Liverpool box and, in attempting to get the ball to Robert Lewandowski, forced Matip into an own goal. And yet, as much as that should have given Bayern confidence and momentum, it seemed to only energise Klopp’s side. With Liverpool initially looking more content to sit and counter through the first half, it was as if they realised just how fragile that German defence was, and began to act on it. Bayern seemed especially tentative around Mane, but there was danger coming from all angles. Salah charged through one of the gaps and hit a thumping drive at Neuer. The goalkeeper didn’t hold that, but did get enough on it. He then just about thumped away a gloriously in-swinging corner, but could do little about what followed. Bayern just had little to counter Van Dijk. The couldn’t handle his presence, or his force. Milner put the ball in the air and Van Dijk put it into the net, heading into the bottom corner. 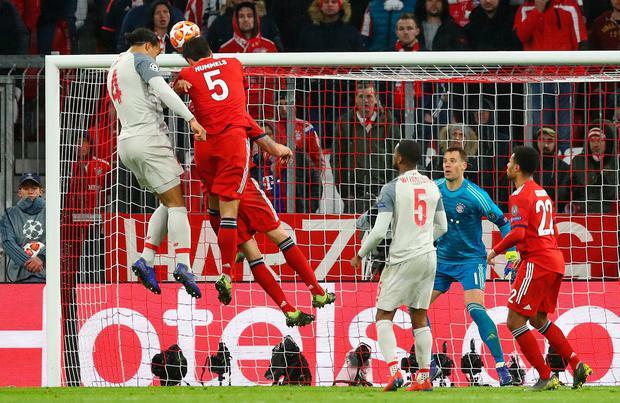 Liverpool really just looked a level above a tired Bayern, who more and more resembled what they are: a past-it team with too many players either past their best, or never good enough for one of the other super-clubs. Liverpool ended the game finding their way through all too easily, with Salah going on one brilliant run that was only stopped by a desperate lucky swing of the leg. They were eventually put out of their misery by the player who most put them through it, as Mane headed the third. The one late downside to the result was that Andy Robertson’s 91st-minute booking, for a foul on Leon Goretzka, will see him miss the first leg of next month’s quarter-final. This was a night to be celebrated though. A night Liverpool made it four English sides in the quarter-finals with one of the most commanding wins any Premier League team will have over Bayern.